Three Boxes to suit your needs, closet, and budget. Whether you're looking for unique & affordable pieces that you can say 'yay or nay' to (Favourites), help with on-trend outfits with wardrobe basics (Gold), or you want to build your accessory collection with Canadian-made Jewelry (Jewel), we have something for everyone. Every box is available in Size Small - 3XL. No commitments - switch product, skip or cancel at anytime. Complete a comprehensive profile so your personal stylist can get to know you, your body and where we can help. Fill out the basics including sizes and preferences then select any items you don't wish to receive. You can update your profile at anytime throughout your subscription to adjust what you're looking for or to accommodate a new size. Your personal stylist would love to see your Pinterest Board to gain insight into your inspiration, so feel free to include this. Your Frock Box Favourites or Gold will be curated just for you by your stylist within 10 business days of sign up. 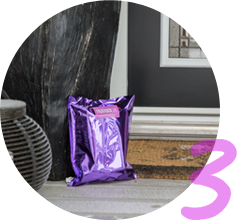 You'll receive a shipping notification from Canada Post by email once your box is on it's way! Frock Box Jewels are shipped monthly on the 6th, so you can expect to see your jewels around the 15th of each month. Sit back and clear some room in your closet! Patiently wait for your pretty package to arrive at your door. Who doesn't love surprises? Inside every Frock Box Gold & Favourites, you'll find hand-picked clothing just for you from your personal stylist. Affordable, trendy, quality items that will help you build a cohesive, unique wardrobe without stepping foot in a mall. Favourites is an excellent choice if you find it challenging to find pieces to fit your shape, want to expand your wardrobe with unique pieces, prefer the option of trying on before buying, don’t love the surprise factor or prefer to avoid the mall. Every month, you’ll receive individually priced items selected just for you to try on. Keep what you want and return the rest! Based on your style profile, your stylist will select five unique pieces that will help build a great wardrobe with on-trend, exciting pieces! You may receive a cardigan, tunic, top, pants and a dress dependent on your preferences and requests. The subscription fee is $24.95 with free return shipping. Your bag will include five clothing items, a return postage label and your invoice which will note the costs. When your returns are received, your credit card will be charged for any items you keep (+GST). Keep one or more items and your subscription fee of $24.95 is deducted from the total. Love everything in your box? Keep it all and receive 25% off the total . Gold Boxes are outfit based and designed for someone who could use a hand putting pieces together. Every month is a surprise, so if you enjoy feeling like a kid at Christmas, then give this a try. 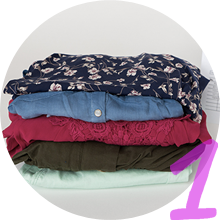 Complete your style profile and wait for your stylist to surprise you with an outfit delivered to your door. Outfits vary depending on season, monthly theme, past pieces, and style profile. An outfit may include a top & bottom, top & cardigan, or dress. You will typically receive 1-2 clothing pieces and 1 accessory (unless you chose not to receive jewelry in your style profile). Your Frock Box will be packed and shipped within 10 business days of sign up or renewal. Sit back and clear some room in your closet! Patiently wait for your pretty package to arrive at your door. Who doesn't love surprises? Frock Box is a monthly clothing and jewelry subscription for women. With three boxes to choose from, we have something for every woman! Frock Box Jewel includes a handmade piece of jewelry or accessory by a Canadian designer for $29.95/month + $3 Shipping. 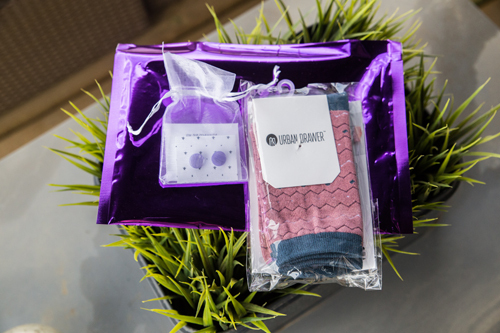 If you love to accessorize while supporting Canadian designers - this box is for you! Featured Canadian jewelry designers have included: Eliasz & Ella, Rishells, VMD Jewelry the Vintage Heart and many more. Frock Box Gold includes 2-3 handpicked items completing an outfit for $59.95/month + $9.95 Shipping. Gold boxes are outfit based and designed for someone who could use a hand putting pieces together. Follow the prompts to subscribe, fill out your style profile and wait for your stylist to surprise you with an outfit delivered to your door. Gold boxes include an outfit tying in your style preferences, current trends and season. Frock Box Favourites includes five handpicked, individually priced clothing pieces every month. Try on at home, keep what you want and return the rest. The monthly styling fee is $24.95 with FREE return shipping. All items must be shipped back within the time-frame indicated on your invoice; otherwise, you'll be billed for the entire bag. The subscription fee is $24.95 with free return shipping. Your bag will include five individually priced clothing items (typically $34-$69/each), a return postage label and your invoice, which will note the fees. Place your returned pieces in the included reusable bag and attach the prepaid shipping label. Drop your parcel off at any Canada Post mailbox or at the Post Office. Upon receipt, your credit card will be charged for any kept items (+GST). Keep one or more items and your subscription fee of $24.95 is deducted from the total. Love everything in your box? Keep it all and receive 25% off the total bill. Keep nothing, you’ll still be billed the styling fee of $24.95. Sizes range from 0-3XL. We want to make sure we have something for everyBODY. When is the deadline to order to receive the next months box? No deadline! You are billed monthly on your sign up date. Your first Frock Box will ship within 10 days of sign up. Can I buy previous months’ boxes? Unfortunately not. Our stylists buy pieces specific to our subscribers and most of our boxes are unique to the individual. Make sure to check out our online shop to view a range of items for sale. Can I switch between boxes? Of course! Try them all out and see what you like. Simply login to your account and change your product. Make sure to switch products before your next renewal date. Where are Frock Box products made? We source from multiple countries and have a variety of goods – some locally made (St. Albert, AB) and others sourced from around the world. Ensuring good quality, affordable products is very important to us. We also strive to work with local “Momprenuers” to help support the Stay At Home Mom dream. Frock Box came about after a “lets meet for coffee” date between friends in St. Albert, AB. They all had ideas, expertise (a former fashion buyer for the Bay, a graphic designer/social media guru and an amazing event planner/PR specialist); but they needed each other to make this website a reality. Several weeks later, after much hard work, Frock Box was born! We hope you like it as much as we do. Your first payment will be made the day you subscribe and subsequent subscriptions are billed on your anniversary date every month. How do I update my credit card information on file? Just login to your customer account and click edit. How often will I receive my Frock Box? You will receive one box monthly. There is no commitment when you subscribe so you can login and cancel or skip at anytime. Please cancel one week prior to your monthly anniversary billing date to avoid being rebilled. You can cancel by logging in to your customer account (www.frockbox.ca/customer/login) and selecting “Cancel” from the “Edit my Subscriptions” box. How can I update my style profile? We get it! Your sizes and preferences change so please email [email protected] to update your style profile or provide your stylist feedback on your last box. When can I expect my Frock Box to arrive? Boxes are shipped through Canada Post within 10 business days of your sign up/rebill date.We do our best to ship out as soon as possible! Yes. Once your box leaves us, you'll receive a tracking email from Canada Post! Login to your account and click edit under address. Make sure to update your address one week before your rebill date. Where do you ship and what is the cost? We currently only ship to Canadian residents. Jewel shipping cost is $3/month. Gold shipping cost is $9.95/month. Favourites shipping cost is free. What is your return policy on Gold Boxes? Frock Box strives to provide an amazing shopping experience and superior customer service. With that said, we understand that something might not be for you. Please contact us and ship the entire box or unwanted item(s) within 14 days of delivery for a credit – If the entire box is returned, you’ll be issued a full credit. If you only want to return some of your items, you’ll be issued a partial credit ($20/piece of clothing) to use towards future boxes or a refund. *You may receive ONE FREE GOLD RETURN shipping code every three months. The cost of return shipping outside of this across Canada will be dependent on the carrier you use and at the returnee’s expense. Email us at [email protected] with “credit” in the subject line and what route you'd like to take. We are not able to accept exchanges on most items because they are specifically purchased for you so we don’t carry a lot of inventory. If we have it, we’ll definitely exchange it for you! Yes! You can purchase a gift card that will be emailed here. You will enter the recipient’s information and they will be notified via email of their gift (if you don’t want them to get it right away, make sure to put in your email address!). They can then use the unique code at checkout upon completing the style survey. 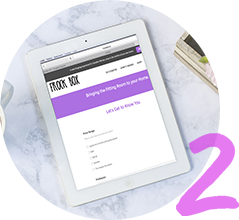 Are you ready to subscribe to Frock Box yet?